Vocational education is emerging as challenge right now due to the low level of relevance between education and quality of graduate workforce. This research aims at describing and analyzing model of plan, implementation, and supervision of entrepreneurship education on agribusiness study programme in Vocational School (SMK). The research approach is qualitative with type of research expost facto, and uses purposive sampling technique with technique of analysis interactive model data. The result of research shows that model of learning plan, implementation, and evaluation still uses semi-modern conventional pedagogy that has not been effective in developing students’ entrepreneurship soft skills ability and there has not been integration among entrepreneurship soft skills proponents (headmaster, entrepreneurship lesson teachers, and other lesson teachers). CBT is emerging as formative theory that can be used in vocational learning and can prepare expected competence that depends on dispositions (values, concerns and manner) that moves into maturity. In accordance, integrated entrepreneurship education development is needed that depends on soft skills and Competence Based Training (CBT) then it can improve graduate quality in creating student entrepreneurship soul on the level of personal maturity, student competence attainment, reduction on workforce needs gap, reduction on unemployment rate, and improvement on numbers of entrepreneurs who become the power of national economy. Education, Entrepreneur, Soft Skills, Vocational School. Entrepreneurship is an important phenomenon in various levels of education that has been community’s need (Lindner, 2012). The challenge of vocational education (SMK) is that the lack of relevance between education and the graduate workforce. Data shows that the highest contributor to unemployment rate is a vocational graduate that makes up 9.27% (BPS, 2017). This condition is far from the goal of entrepreneurship education that should be able to create employment opportunity by vocational school graduates. Data shows that the average number of vocational graduates on agribusiness study programme that become entrepreneur are relatively small making up less than 2% per year. This condition is caused by soft skills development that is not optimal and only emphasizes on hard skills. Lans et al. (2014) suggest the need for further research on entrepreneurship education, where teachers are supposed to create competency based curriculum and creative learning to support sustainable entrepreneurship instruction. Dimension of soft skills and CBT becomes the primary focus to obtain skilled knowledge that is beneficial to overcome the problem (Abungu et al., 2014). Ruskovaara et al. (2016) state that entrepreneurship education prioritizes training system for head master and teachers, so (Bikse et al., 2014) it is needed education levels including all lessons, administration, teachers, students, and organizations. Success in life is more determined by soft skills (Sailah, 2008) than of hard skills, because of attitude and behaviour change starting from soft skills level of each individual that is entrepreneurship education results (Martin & Lucu, 2014). Soft skills must be possessed by every human resource, especially output from education since human resources that do not have soft skills will affect unemployment rate (Paadi, 2014; Samta, 2013; Robles, 2012; Pop and Barkhuizen, 2010). Din et al. (2016) say that entrepreneurial mindset and programme effectiveness become the important key to create entrepreneurs, but (Todorov & Papazov, 2014; Purnomo, 2014) entrepreneurship education is at the moment still considered as “isolated island”. To respond the existing problems, the researcher conducts a research to describe and analyze model of plan, implementation, and supervision to entrepreneurship education on agribusiness study programme in vocational school, therefore entrepreneurship education model can be identified then it can be developed and has an impact on the intention improvement and entrepreneurship manner among vocational school students on agribusiness study programme. This research is conducted on agribusiness study programme in SMK N 1 Bawen and SPMA N Ungaran. There are two primary reasons to select agribusiness students: first, because agribusiness is a study programme that still needs to be developed, in addition since the study of entrepreneurship manner is very important in agribusiness. The results of this study can be beneficial for education policy makers to understand exsisting models, moreover the implication for entrepreneurship soft skills intervention and development. The method used in this research is qualitative approach with type of research expost facto. The main data source of this research is determined by using sampling purposive technique. Sampling purposive technique is the most effective type of non-probability sampling type when someone needs to learn certain cultural domain to obtain deeper knowledge (Tongco, 2007). This technique is done by selecting respondents who are considered to understand condition and implementation of entrepreneurship education management (headmaster, vice of headmaster in curriculum and student affairs, head of expertise programme, BK, teachers, business/industry and several students). The primary data is collected through observation and interview technique. Analysis of descriptive qualitative data with analysis technique interractively (data reduction, data display, and conclusion drawing/verification). Descriptive results of entrepreneurship education are described related to entrepreneurship profile and proposed research model focused on plan, implementation, and supervision to entrepreneurship education on agribusiness study programme. Agribusiness study programme students are divided into four skill programmes namely agribusiness agricultural products, agribusiness crop production, livestock agribusiness production, and agricultural mechanization with 32 study groups that consists of 1,169 students. In supporting the school vision, SMK collaborates with a number of companies. Just as Barba-Sánchez and Atienza-Sahuquillo (2018), they show the seriousness of entrepreneurship implementation in Europe by creating task force or steering group (including education department and other departments such as: economy; employment; science and research) to determine how entrepreneurship can be integrated into the education system especially elementary, middle and high level. Entrepreneurial action can be understood as an innovative action through organized human relation system and combination of resources, it should be directed to certain attainment (Liao and Gartner, 2006). Entrepreneurship can be encouraged through education, therefore entrepreneurship education is a device in growing and developing entrepreneurship manner from agribusiness skill programme including competing globally, and based on written mission that contains dedication, creativity, broad mindedness, skill, independence, and ability to develop themselves. The research results show that entrepreneurship soft skills type that is developed is elaboration of vision and mission, but it has not been optimal and its implementation is dominant with hard skills, intense involved actors are only entrepreneur and productive lesson teachers who have not synergized to each other, as well as plan, implementation, learning evaluation still uses semi-modern conventional pedagogy and is less contextual. Entrepreneurship phenomenon needs to be informed massively in Indonesia, through specific subjects on business creation in various study programmes (Sardeshmukh and Smith-Nelson, 2011), the creation of entrepreneurship supporting units (Crum and Chen, 2015) or the development of specific action to encourage business creation (Colette et al., 2005), such as business idea competition, business incubator, encouragement and support to begin, etc. Entrepreneurship education on agribusiness study programme in SMK is planned to be held at the beginning of each semester by considering various aspects including objective, actors’ involvement, material, media, method, and evaluation of entrepreneurship education. Important issues in this plan are the teacher’s involvement, head master, business/industry in entrepreneurship education, and sustainable evaluation of entrepreneurship education implementation. 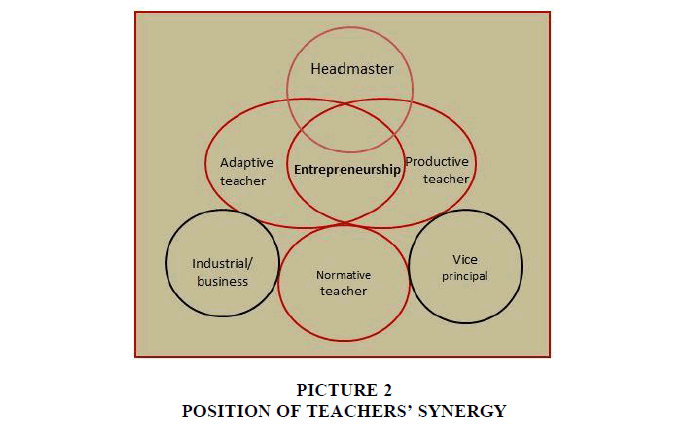 As the policy maker, head master should inform, teachers must possess background in science and entrepreneurship experience (Figure 1). Entrepreneurship education plan is firstly done by teaching team declaration, learning plan implementation is in line with syllabus and curriculum and strategic plan (there has not been business and industry world involvement). Any activity outside learning subject is planned by involving students in school production unit such as school canteen and business centre and participate in exhibitions to promote their work results. From the research results, context of entrepreneurship education that is developed through industrial work activity is not explicitly written in MOU but, implicitly, industrial work practice prepares students for knowledge transfer, production process, and has not developed entrepreneurship manner and transmission. Strategy used in entrepreneurship education in SMK in its implementation has not been optimal. The indication can be seen from the learning method used that are relatively similar to other lessons in the form of hard skills that is normative and adaptive material (Figure 2). Lee et al. (2011) have proposed a psychological economic method, providing alternative explanation for entrepreneurship phenomena, Jones and English (2004) also proposes action oriented mixed teaching that encourages project based learning. The most frequently used method is reading, class discussion, and business plan, using prestigious entrepreneurs’ case, and inviting local entrepreneurs to increase graduates' knowledge about entrepreneurship and encouraging them to become job creators rather than job seekers (Barba-Sánchez and Atienza-Sahuquillo, 2018). 4. Livestock production unit that produces fresh milk and processed milk (yogurt) to organic fertilizer. 5. Agribusiness production unit of sweet corn cultivation with trusted brand “SMK sweet corn”. 10. Field trip business unit for kindergarten and elementary students to learn about agriculture. Identification process of entrepreneurship soft skills conducted in SMK is only limited to “selling” ability. Entrepreneurship education plan is still contemplative, it is found only in lessons that contain entrepreneurship education concept implementation such as PKWU and productive lessons. Research results show that there are several weaknesses in entrepreneurship education management in agribusiness skill programme. For example, it deals with human resources, materials, facilities, and infrastructures. Meanwhile, it is contemplative on the process of learning and teaching entrepreneur (adaptive) with productive subjects, due to the lack of synergy among educators. This soft skills development is done through extracurricular activities, especially spiritual activities. Entrepreneurship education that is planned covers four aspects: craft, engineering, cultivation, and processing that is aimed at developing products using technology that is according to home industry scale. Successful entrepreneurship skill is measured on the level of institution. Head master controls students’ entrepreneurship soft skills by conducting incidental supervision, and then provides general evaluation and its results are submitted to daily apple. Level of entrepreneurship soft skills attainment is assessed in each semester. Measurement in the final stage is done partially in several departments that cannot hold productive entrepreneurship based training, while for some holistic test based training programmes might be applied for productive training with entrepreneurship based system. Then, competency test conducted on Agribusiness Expertise Programme is held by LSP (Profession Certification Institution) from Malang. Certificates obtained by students are recognized nationally and internationally. Ismail and Zain (2014) explain that in forthcoming research the measurement device can be developed for entrepreneurship to obtain standard of entrepreneurship graduate competence. Townsend et al. (2010) explains that novelty in creative and innovative thinking is needed in entrepreneurship application because (Rekha et al., 2015) innovative action is creativity to identify problems, to do innovation, and creating business. In creating business, it involves two levels (Barba-Sánchez and Atienza-Sahuquillo, 2017): rational level and motivation level. 1. Having internal motivation and caring for environment in searching for information about cultivation diversity and food and non-food processing. 2. Showing honesty, confidence, and independence in introducing cultivation activity and food and non-food processing. 3. Inviting cooperation, mutual cooperation, tolerance, discipline and is responsibility in designing cultivation activity and food and non-food processing. Management of entrepreneurship education needs to be developed, one of which is integrated entrepreneurship education model based on soft skills and CBT (Competency Based Training). Alonso et al. (2016) say that management presents new approach to transmission model of knowledge and competency development. Barba-Sánchez and Atienza-Sahuquillo (2018) provide evidence that effectively entrepreneurship training is done with several improvements. Mathematically, this concept is similar to soft skills=intrapersonal quality+interpersonal skill. The importance of entrepreneurship lesson is to learn entrepreneurship cultural democratization, expansion of teaching professional and technological development (Cunha et al., 2016; Lackeus, 2015; Debyser, 2013). Therefore, model of entrepreneurship education for agribusiness students has not been optimal and soft skills and CBT based development is needed, besides helping various public authorities to establish steps and strategies to maximize resources. As in line with Zhao et al. (2005), formal learning from lessons that are related to entrepreneurship has the strongest positive relations with intention through entrepreneurship self-efficacy mediation (Table 1). Model of entrepreneurship education on Agribusiness study programme in SMK has not been optimal because the subject is still dominated with hard skills. The development of entrepreneurship soft skills that is applied has not synergized in planning, implementation, and evaluation. Evaluation of entrepreneurship soft skills development programme is not planned systematically and consistently. Based on the above conclusion, among the suggestions that should be considered is synergy among entrepreneurship education components, improving personnel qualification, developing cooperation with business/industry and government policy and commitment on entrepreneurship education in vocational school. Therefore, it is needed an integrated entrepreneurship education model based on soft skills and CBT to improve graduates quality in building students’ entrepreneurship soul on the level of personal maturity, students’ competence attainment, reduction of labour needs gap, reduction in unemployment rate, and increasing number of entrepreneurs who become national economic initiator/power. The researcher’s limitation in this research has not been measured quantitatively with limited research subjects, in accordance the next research requires development research model (R&D) with wider sample coverage. Alonso, G.A., Diaz, M.A., & Peris, O.M. (2016). Increased entrepreneurship in the Colombian Universities: Competency approach plus personalized advice (CAPPA) models in educational tools for entrepreneurship. Springer International Publishing, 101-112. Abungu, H.E., Okere. M.I.O., & Wachanga, S.W. (2014). The effect of science process skills teaching approach on secondary school students achievement in chemistry in Nyando district, Kenya. Journal of Educational and Sosial Research, 5(6): 2240-0524. Barba-Sánchez, V., & Atienza-Sahuquillo, C. (2017). Entrepreneurial motivation and self-employment: Evidence from expectancy theory. International Entrepreneurship and Management Journal, 13(4), 1097-1115. Barba-Sánchez, V., & Atienza-Sahuquillo, C. (2018). Entrepreneurial intention among engineering students: The role of entrepreneurship education. European Research on Management and Business Economics, 24(1), 53-61. Bikse, V., Riemere, I., & Rivza, B. (2014). Improved management of entrepreneurial education in Latvia. Procedia-Social and Behavioral Sciences, 140, 69-76. Crum, M., & Chen, Y. (2015). Self-employment and subjective well-being: A multi-country analysis. International Journal of Entrepreneurship, 19(1), 15-26. Cunha, C., dos Santos, B.C.P., & Sereno-Ramirez, A. (2016). Entrepreneurship education: A tool for the development of technological innovation. Educational Tools for Entrepreneurship Springer International Publishing, 73-86. Colette, H., Hill, F., & Leitch, C. (2005). Entrepreneurship education and training: Can entrepreneurship be taught? Education+Training, 47(3), 158-169. Debyser, A. (2013). Promoting Entrepreneurship through Education. European Parliament Research Agency, 130635, 1-6. Din, B.H., Anuar, A.R., & Usman, M. (2016). The effectiveness of entrepreneurial education programs in improving entrepreneurial skills among state students. Procedia-Social and Behavioral Sciences, 224, 117-123. Ismail, V.Y., & Zain, E. (2015). Portrait of entrepreneurial competence in student entrepreneurs. Procedia-Social and Behavioral Sciences, 169, 178-188. Izquierdo, E., & Buelens, M. (2011). Competing models of entrepreneurial intentions: The influence of entrepreneurial self-efficacy and attitudes. International Journal of Entrepreneurship and Small Business, 13(1), 75-91. Jones, C., & English, J. (2004). A contemporary approach to entrepreneurship education. Education and Training, 46(8-9), 416-423. Karimi, S., Biemans, H.J.A., Lans, T., Chizari, M., & Mulder, M. (2016). The impact of entrepreneurship education: A study of Iranian students’ entrepreneurial intentions and opportunity identification. Journal of Small Business Management, 54(1), 187209. Lackeus, M. (2015). Entrepreneurship education (what, why, when, how). Entrepreneurship360 Background Paper. Lans, T., Popov, V., Oganisjana, K., & Täks, M. (2013). Learning for entrepreneurship in heterogeneous groups: Experiences from an international, interdisciplinary higher education student programme. TRAMES, 17(4), 383-399. Lans, T., Blok, V., & Wesselink, R. (2014). Separate and shared learning: Towards an integrated competency framework for entrepreneurship that is sustainable in higher education. Clean Production Journal, 62, 37-47. Lee, L., Wong, P.K., Foo, M.D., & Leung, A. (2011). Entrepreneurial intentions: The influence of organizational and individual factors. Journal of Business Venturing, 26(1), 124-136. Liao, J., & Gartner, W.B. (2006). The effects of pre-venture plan timing and perceived environmental uncertainly on the persistence of emerging firms. Small Business Economics, 27(1), 23-40. Lindner, J. 2012. Entrepreneurship Education between economic educational philosophy and key competence for lifelong learning. Initiative for Teaching Entrepreneurship (IFTE) & the Impulse Centre for Entrepreneurship Education (EESI) of the Austrian Federal Ministry for Education, Arts & Culture. Martin, C., & Iucu, R.B. (2014). Teaching entrepreneurship to students of education. Procedia-Social and Behavioral Sciences, 116, 4397-4400. Mesquita, C., Lopes, R.P., & Bredis, K. (2016). Entrepreneurship in higher education is a horizontal competency. Educational Tools for Entrepreneurship, Springer International Publishing, 223-241. Paadi, K. (2014). Perceptions of job skills required to improve human resource management passing prospects securing relevant places in the labor market. European Scientific Journal. Pop, C., & Barkhuizen, N. (2010). Relationship between internship skills and retention training graduates in South Africa's information, communication and technology company. Information Litracy and Computer Education Journal (LICEJ), 1(2), 78-83. Purnomo, M. (2014). Alternative Models of Entrepreneurship Education for Eastern Indonesia. Proceedings: East Indonesia National Seminar, Center for Eastern Indonesian Regional Studies (PUSKIT), Atma Jaya University, Yogyakarta. Rekha, S.K., Ramesh, S., & Jaya-Bharathi, S. (2015). Empirical study on the relationship between entrepreneurial mindset and the factors affecting intrapreneurship: A study in Indian context. International Journal of Entrepreneurship, 19(1), 53-59. Robles, M.R. (2012). Executive Perceptions of the 10 Soft Skills Needed at the Current Workplace. Quarterly Business Communication, 75(4), 453-465. Ruskovaara, E., Hämäläinen, M., & Pihkala, T. (2016). The HEAD teacher manages entrepreneurial education - empirical evidence from general education. Teaching Education and Teachers, 55, 155-164. Samta, J., Afreen, A., & Syed, S. (2013). Facilitating the acquisition of soft skills through training. Soft Skills Journal, 7(2), 32-39. Santateresa, P.I. (2016). Fostering entrepreneurship in higher education, with problem-based learning. Educational Tools for Entrepreneurship, Springer International Publishing, 167-182. Sardeshmukh, S.R., & Smith-Nelson, R. (2011). Educating for an entrepreneurial career: Developing opportunity recognition ability. Australian Journal of Career Development, 20(3), 47-55. Sailah, I. (2008). Soft skills development in higher education.Development team of the directorate general of higher education: Higher education. Todorov, K., & Papazov, E. (2014). A successful model of entrepreneurship education & training in transition countries: The example of Bulgaria. Tongco, M.D.C. (2007). Purposive sampling as a tool for informant selection. Ethnobotany Research and applications, 5, 147-158. Townsend, D.M., Busenitz, L.W., & Arthurs, J.D. (2010). To start or not to start: Outcome and ability expectations in the decision to start a new venture. Journal of Business Venturing, 25(2), 192-202. Zhao, H., Seibert, S.E., & Hills, G.E. (2005). The mediating role of self-efficacy in the development of entrepreneurial intentions. Journal of Applied Psychology, 90, 1265-1272.